This summer on a number of mornings I walked different routes in Bartlesville both for regular exercise and to prepare myself for my Oregon day hikes. There are three routes I like to walk. My favorite is to park near the Memorial Bridge on Adams and make a 4.5 mile loop. 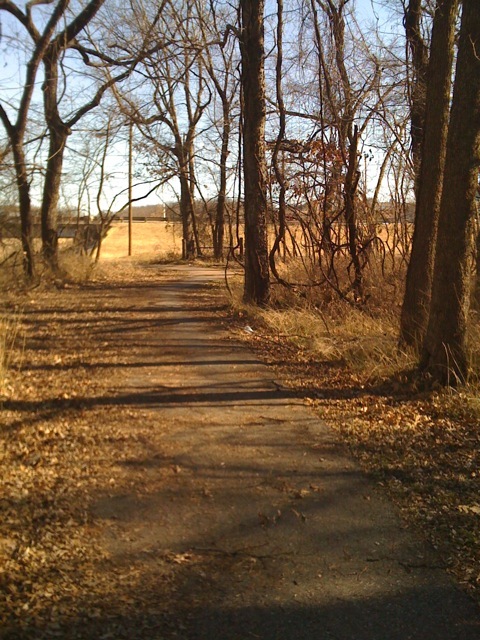 I walk up over the bridge and follow the bike trail under Adams and then south along Silver Lake Road until I reach the Wesleyan fields. Then I turn west on the Pathfinder Parkway and follow it across the Caney River, then parallel the river northwards past the high school and back up to Memorial Bridge. I’ve used my iPhone’s MotionX GPS app to record these walks. Here’s a KMZ file for the Caney/Silver Lake Loop you can open in Google Earth. To use it, RIGHT-click on that link, save the link to your computer and then open that KMZ file in Google Earth. I took advantage of the cool weather this morning to walk this route, which is a 4.0 mile roundtrip. This summer the city has been working to widen and redirect portions of this route around erosion along Turkey Creek and the Caney River, so I haven’t been on it as much as usual. I park either at Atwoods or the Memorial Bridge and take the woodsy Pathfinder Parkway along and over Turkey Creek and past M.J. Lee Lake and along the Silver Lake road extension to Robinwood Park. There I cross the Caney on the Frank Phillips bridge and take the southern fork of the Pathfinder down to the Memorial Bridge on Adams. You can get a good view of the old interurban trolleyway near the Caney River along the latter part of the walk, and I always enjoy walking past the orchard between Frank Phillips and Tuxedo boulevards. 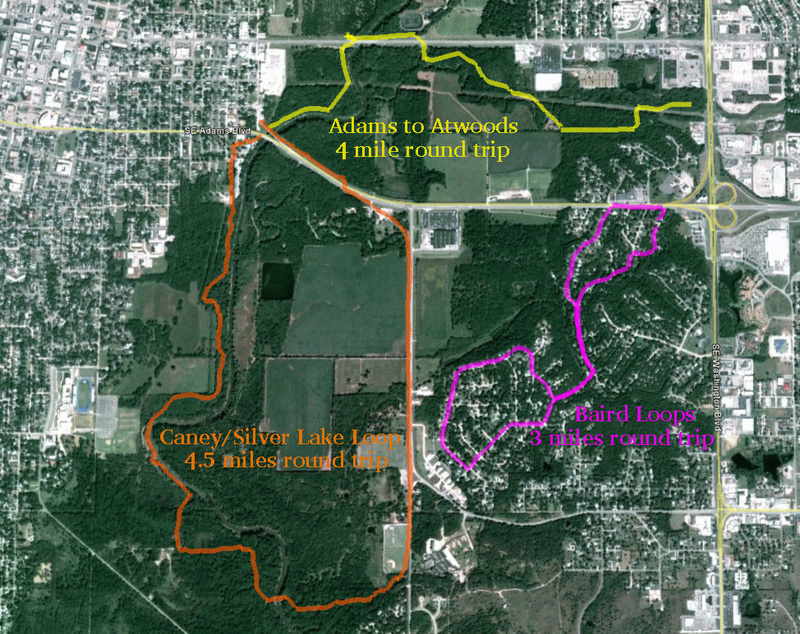 Here’s the KMZ file for the Adams to Atwoods route. For several years John Baird, former BHS calculus teacher, has kindly invited me to walk with him through the Woodland Park neighborhood where he lives. John pieced together a two-loop route that adds up to 3.0 hilly miles, contrasting to the above level Pathfinder Parkway routes. After this walk I’m always happy to join John for a drink at Jude’s, although he prefers coffee over my pricey Italian soda. Here’s the KMZ file for the Baird Loops. There are other routes I could take, of course. 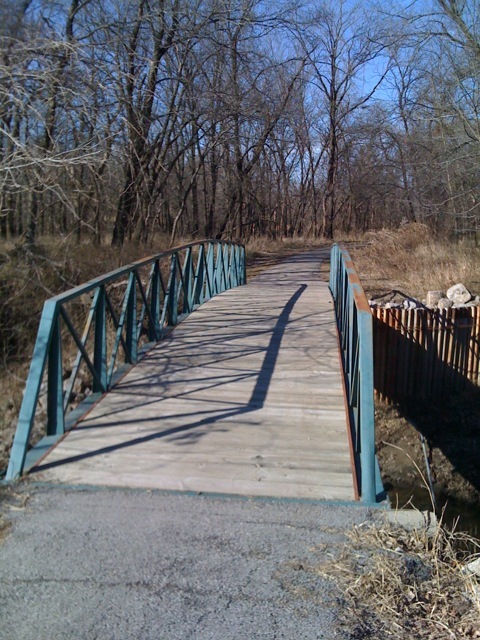 The Pathfinder Parkway extends from Robinwood to Johnstone Park, for example. 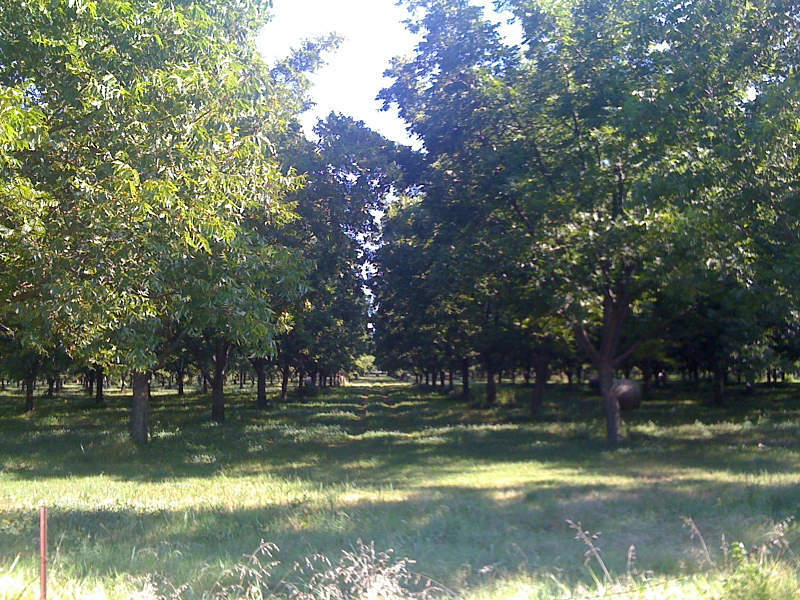 I like the part of the path around the orchard, past Blazer softball fields, and then by some fields where there are a couple of horses. There is an oddball bench along there that is great to lie down on for some sun in the autumn. But I seldom venture on west from there past the sewage treatment plant. The Pathfinder Parkway also extends from the Wesleyan fields up a steep hill past the church and out from the woods onto the open land and developing neighborhoods near Wayside school and down to Jo Allyn Lowe Park and even under Price Road into Colonial Estates. This portion of the Pathfinder seems to be the busiest, but I prefer the woodsy river or creek portions of the trail. 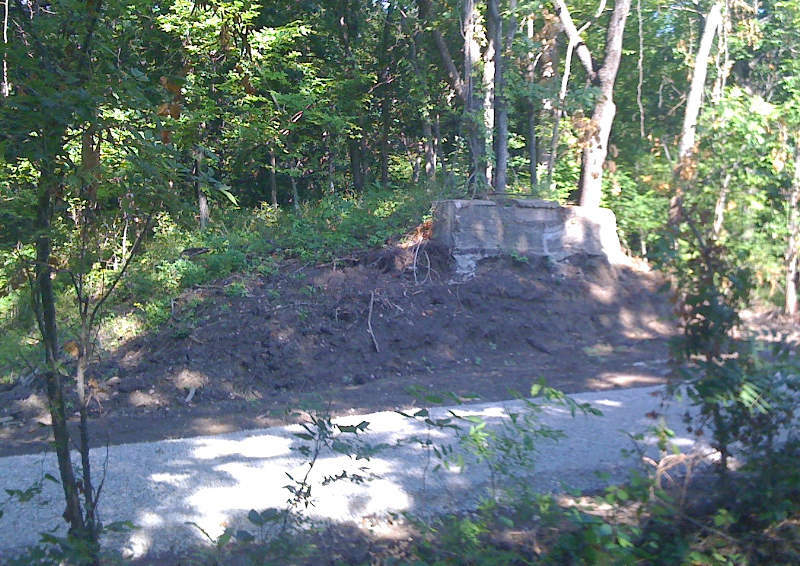 I used to ride my bike a lot along the Pathfinder Parkway from the Will Rogers School over to Sooner Park, back when I rented a house on Yale Avenue. But that segment is too short to attract me these days. I’d love for the city to extend the Pathfinder from Colonial Estates eastward south of the Food Pyramid, cross under Washington Boulevard, and on northeast along Bird Creek past my own neighborhood over to Tri-County Tech. But I won’t hold my breath. This entry was posted in day hike, random. Bookmark the permalink.